Seventeen more fighters at the welterweight and lightweight divisions complete the EA Sports MMA roster, bringing to 60 the total number of combatants in the game. Joachim Hansen, Shinya Aoki, Tatsuya Kawajiri, Jay Hieron, Marius Zaromskis, Hayato Sakurai, and Tyron Woodley are the new welterweight fighters, joining Robbie Lawler, Nick Diaz, Kazuo Misaki, Lyman Good, Pat Miletich, Jake Shields, Joe Riggs, Matt Lindland, Frank Trigg and Nick Thompson, who were revealed last week as middleweight eligibles. 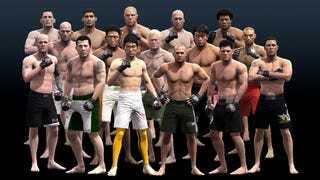 By comparison, UFC Undisputed had 40 fighters spanning its welterweight and flyweight, 99 in its main roster and up to 106 available overall (seven were available as PS3 exclusives or pre-order bonuses). Above are the welterweights. Below is the legend identifying them, then the lightweights and the legend for those fighters. EA Sports MMA is out Oct. 19 on Xbox 360 and PS3.